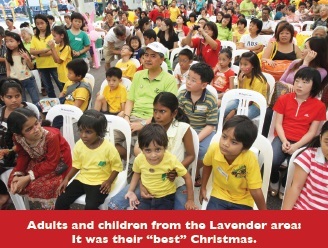 DECEMBER 18 and 19, 2010 will long be remembered by some 4,000 residents from the Lavender area who attended the Christmas Carnival organised by Hinghwa Methodist Church in partnership with four community organisations. To many of them, it was their “most memorable” and “best Christmas” ever, and this delighted the Guests-of-Honour, Dr Lee Boon Yang and Ms Denise Phua, MPs for Jalan Besar GRC. The carnival was Hinghwa Methodist Church’s biggest community outreach event, organised in partnership with the People’s Association, Jalan Besar Community Club, Rowell Court, and the Kampong Glam Community Club. e theme of the carnival was Joy@Lavender, and it was aimed at reaching out and blessing the community, and sharing with them the message of Christmas. Many were prayed for and 10 people received salvation. The carnival was held along the stretch of Townshend Road, which fronts the church. A Road Closure Permit was granted to the church for two days by the relevant authorities. ere was also approval from the National Parks to light up the trees along the road. It was such a beautiful sight in the evening. e 100-metre stretch of road allowed the church to set up 20 games stalls and several food stalls and a stage for performances. The carnival was declared open by the Rev Goh Aik Hiang, Pastor-in-Charge of the church, on Dec 18 at 11 am. Immediately after that a large crowd formed a queue to collect coupons entitling them to play the games and exchange them for food. There were performances throughout the day by professional artistes. Among them was Babes Conde, the main vocal coach for the Singapore Idols. Together with her friend Catherine Ong, they sang several of their favourite songs and Christmas carols. The evening performance was run by the team ORTV (Overseas Radio Television). Running concurrently were two competitions with participants from the community. The street soccer was held at the Kampong Glam Community Club soccer court. ere were eight participating teams. On Dec 19, the Children’s Art competition was held in the church and a total of 80 children from the community took part. 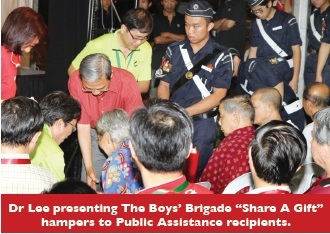 At a reception for the Guests-of-Honour and community leaders on Dec 18, Dr Lee and Ms Phua presented e Boys’ Brigade “Share A Gift” hampers to Public Assistance recipients. e winning soccer team also received its prize from Dr Lee. In his address, Dr Lee praised Hinghwa Methodist Church for helping to forge a united, resilient community in Jalan Besar regardless of race and religion. He said: “What Hinghwa Methodist Church is doing is what the other religious organisations in Singapore should be doing. Reach out to the people living in our community. Be part of the grassroots network to serve the people. Another highlight was the Parade of Christmas Floats. Seven beautifully decorated floats with Scripture verses referring to the birth of Christ were parked along the stretch of Maude Road for about half an hour before they paraded around the constituency. 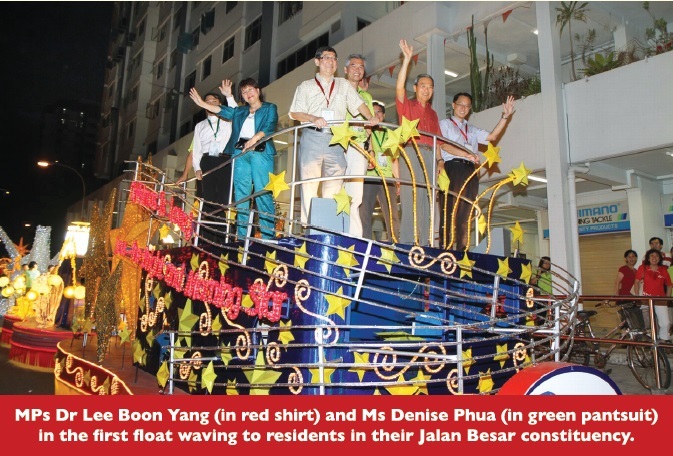 The residents were surprised to be treated to the colourful floats. Many families gathered to have their photographs taken with the floats, which were escorted by Police Outriders, whose presence further thrilled the crowd. Ms Phua gave away prizes to the winners of the Children’s Art competition on Dec 19. She then visited the games stalls and interacted with the people. The carnival ended with a combined worship. 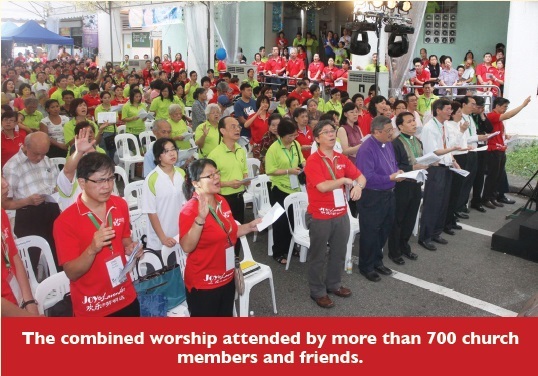 For the first time the church gathered as one body with more than 700 members, including leaders and pastors from the Yishun Methodist Mission, praising and worshipping God in public. The speaker was Bishop Dr Robert Solomon. His message was entitled “When God Gets rough To Us”, based on the Scripture text from Luke 2:8-20. 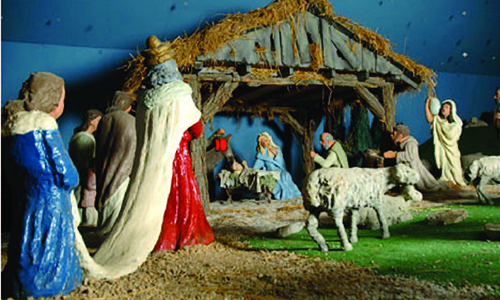 He said that the greatest breakthrough into the human world was the birth of Jesus. It was the turning point in history. “God Himself visits the earth. When the shepherds gathered around the Christ child, they saw with their own eyes God’s clear breaking through into the dark mists of human history. God had broken through to Old Testament characters like Moses, Samuel, David and Isaiah. But this time He broke through in a decisive and altogether significant way. Summing up the two-day event, a church leader said: “The response from the people who turned up at the Christmas Carnival was beyond our expectations. The people were very happy and filled with joy. Glory be to God. Yap Chee Heng is an Associate Lay Leader and Chairman of the Outreach and Social Concerns of Hinghwa Methodist Church. 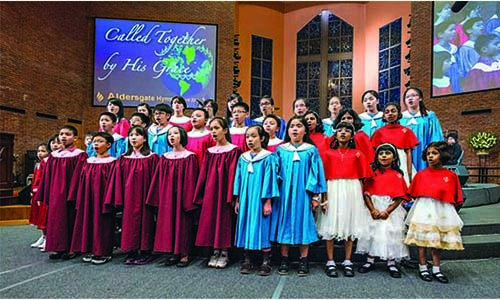 FRIENDS FROM the Inter-Religious Organisation and other faith communities celebrated the joy of Christmas with members of Kampong Kapor Methodist Church (KKMC) at their Christmas Day Service last year. In a world so divided and pained by religious conflicts, KKMC hopes to bear witness for Christ and His ministry of reconciliation between the various faith communities.